Sub merger of most of the indirect taxes at State level and at Centre into one single Tax - GST. No cascading effect of taxes, as credit for tax paid by the vendor supplying the goods will be fully adjustable in tax payable on sales invoices by the seller, at the time of sales- Seamless credit in successive transactions. Destination or consumption based taxation i.e. the tax will be borne by ultimate consumer in the state of consuming goods and service. Exports to be more competitive. Movement of goods within India to ease significantly. India to emerge as one single market, expanding growth potential. The benefits could be many and all of them cannot be enlisted. The Modi Government biggest success is to achieve unanimity in Rajya Sabha, which will pave way for smoother parliament democracy and better political atmosphere, being most important for peace and progress. BJP, PM Narendra Modi, Shri Arun Jaitely, Shri Amit Shah all are to be congratulated. At the same time congress, and entire UPA as well as communist party all are to be given adequate credit for their support. The constitution amendment bill is now required to be passed by majority of the Sates in their State legislature. Thereafter only the constitutional amendment will become valid on receiving President assent. The actual drafts of these laws are to be fine- tuned before presenting the same before the parliament and all state legislatures. The bills will be required to be debated thread bare to examine all practical issues and to find workable solutions acceptable to all stakeholders. This looks simple but complexities will come as various stakeholders examine actual impact on them. In all likelihood bills will be referred to select committee of parliament as well as of State level select committees of the state legislature, where all stakeholders will be heard. adversely. The law need to be disseminated, understood and all processes will need finalization by each stakeholder. Even the accounting and ERP software will have to be substantially upgraded and modified to change entirely in accordance with law. A reasonable target of final notified date could be 1st April 2019. Information technology backbone, system and processes. Department and officials to administer manufacturers, traders, service providers- division between states and central Government. Even the Government machinery will need training and understanding of law clearly. Process to ensure that no large refunds or unadjusted credit remains with dealers e.g. with exporters, adversely impacting trade or commerce. Special tax zone like Jammu & Kashmir, Uttaranchal, Assam and Eastern states, Himachal -existing continuing exemptions on "NIL" tax regime & other migration issue. Incentive mechanism for segments to be promoted. Tax on food items, housing, jewellery, education, health, legal services, regulatory and government services needs careful handling. Off books transactions and parallel economy will be a larger challenge. Tax rate on services has to be much lower than Goods to ensure growth of service sector, existing credits, procedures, processes, returns, registration, exemption threshold and so on. 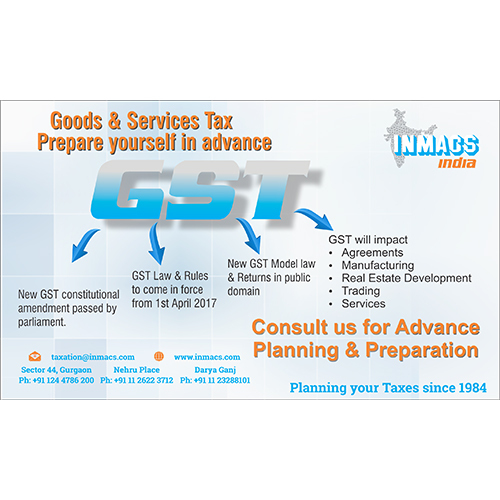 We, Chartered Accountants will have a major role in GST's successful implementation and its effectiveness, efficiency and smooth functioning. We are ready to take on the major task ahead and support the Government as well as businesses in implementation, with minimum pain and teething troubles in initial 2 years & thereafter.